There is no doubt that an allergy to any food can be stressful, but milk presents greater issues than most. It’s one of the most revered foods in the American diet, and thanks in part to School Milk Programs, it’s rampant in our schools. 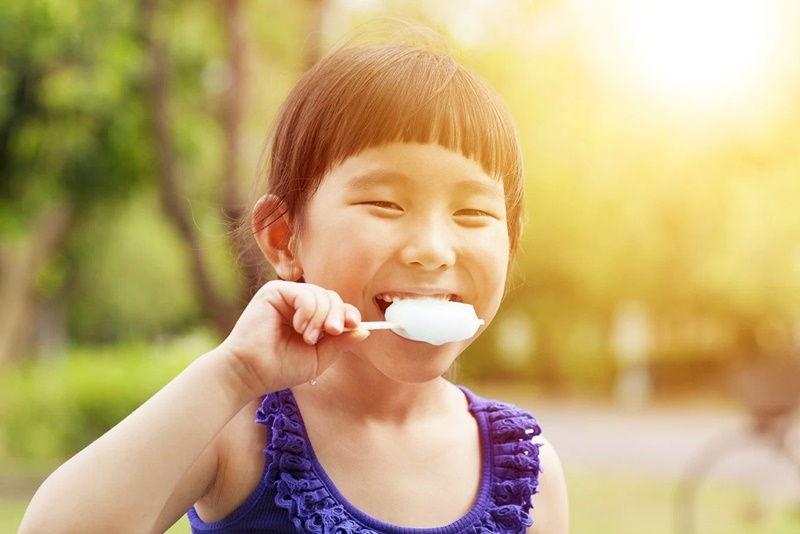 For students with milk allergies, high risk dairy foods can seem impossible to avoid. From the “required” milk in government-sponsored lunches to in-class birthday parties with buttery-iced cupcakes and ice cream, dairy is everywhere. Plus, people often confuse milk allergy with a less serious and very common milk reaction, lactose intolerance. A while back, I had the opportunity to interview Kelly Rudnicki, a popular cookbook author who has a child with multiple food allergies. His list includes peanuts and tree nuts, but she says his milk allergy is her biggest concern. “The most misunderstanding I get is with milk allergy,” says Rudnicki. “You want every allergen to be taken as seriously as peanut, but if it isn’t a peanut or nut allergy, it’s not getting respect.” Kelly said at least once every school year, something with dairy in it has crossed her son’s path. Parents like Kelly are making strides in milk allergy awareness, but the problem won’t resolve overnight. Therefore, I recommend understanding the high risk dairy foods in school and how to manage them. This post is sponsored by So Delicious Dairy Free. 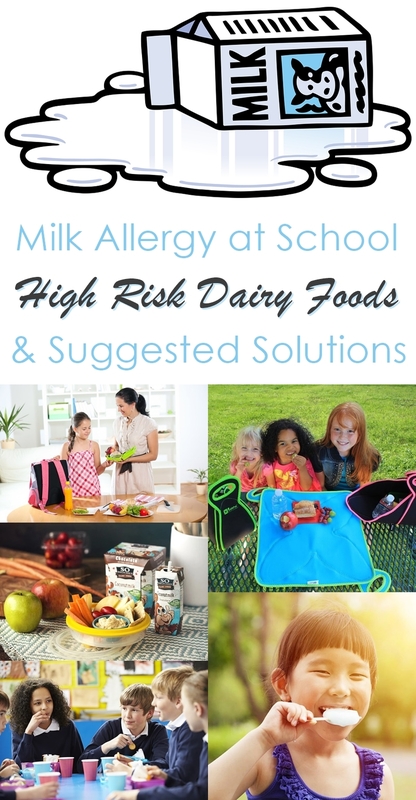 They asked to be a part of providing helpful milk allergy information for back to school. 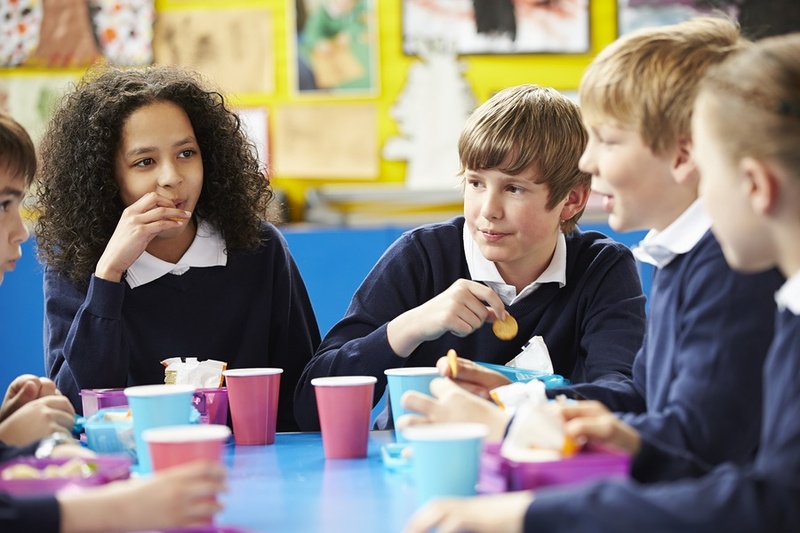 Below are five of high risk dairy foods and situations that occur quite often in most school settings. I’ve included an explanation of the challenges along with some ideas to help you and your milk allergic kid navigate this milk minefield. When most people think of dairy products, foods like milk, cheese and yogurt immediately come to mind. 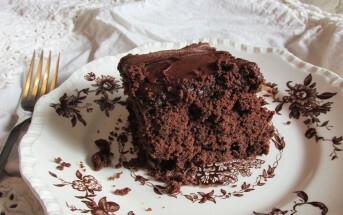 But in terms of cross-contamination potential, milk powders are tops on the list. They may linger on chips, crackers, popcorn, and other flavor-coated foods and can easily be tracked to different areas (even door handles) with messy hands. And unlike most other dairy foods, milk powders can “float”. Similar to dust particles they might land on desks, tables or other surfaces. Provide the teacher and parents with a “safe snack list” as a guide. Make sure it includes several reasonably priced products. Although many parents won’t reference it, some probably will. For those who ignore your list, request that they pack “unflavored” varieties that don’t have a “contains” allergen statement for milk. Most kids will be fine with plain potato chips, tortillas chips or crackers, and don’t need the Ranch or Cheddar to be satisfied. Yes, it happens with great regularity in schools from pre-K on up through high school. The milk cartons that school lunch programs provide have nice wide spouts that can cause a cannonball-style splash when dropped or toppled. Fluid milk can spread fast and far, but it’s more visible than milk powders making it much easier clean. Make sure the teacher, cafeteria staff and friends of your kid understand a protocol for quickly and thoroughly cleaning any spills. 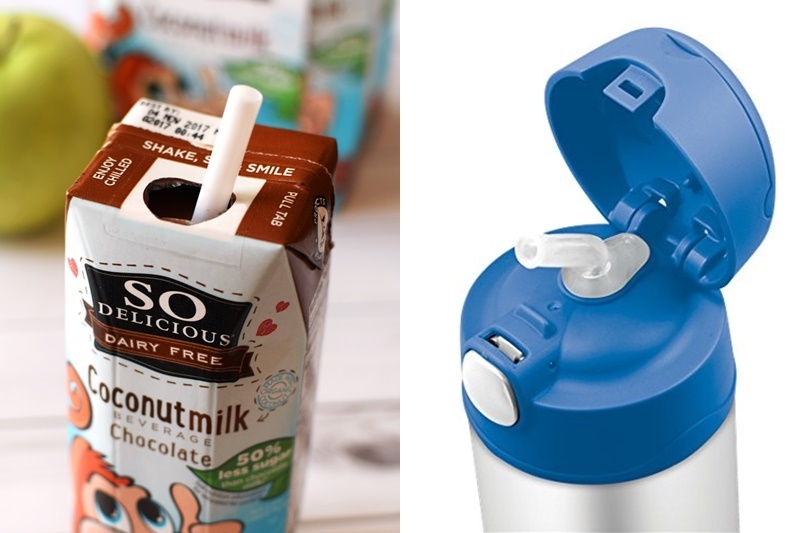 For kids who bring their own milk, request that parents buy enclosed single-serves, or that they pack it in a thermos with a sip-top rather than a lid opening. Soft cheeses, yogurts, puddings, and squeeze tubes are common in lunch boxes and can easily spread on hands and eating areas. You can provide a list of safe brands on your snack list. 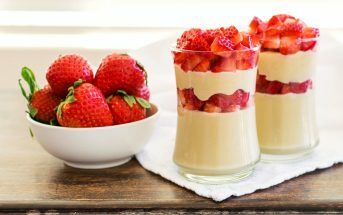 Dairy-free yogurts are becoming readily-available, and a few parents may be excited about the options. Ensure that the classroom has desk-wiping and hand-washing policies after food is eaten in a classroom. This is becoming a typical procedure and helps to prevent sticky hands from transferring food to common surfaces. 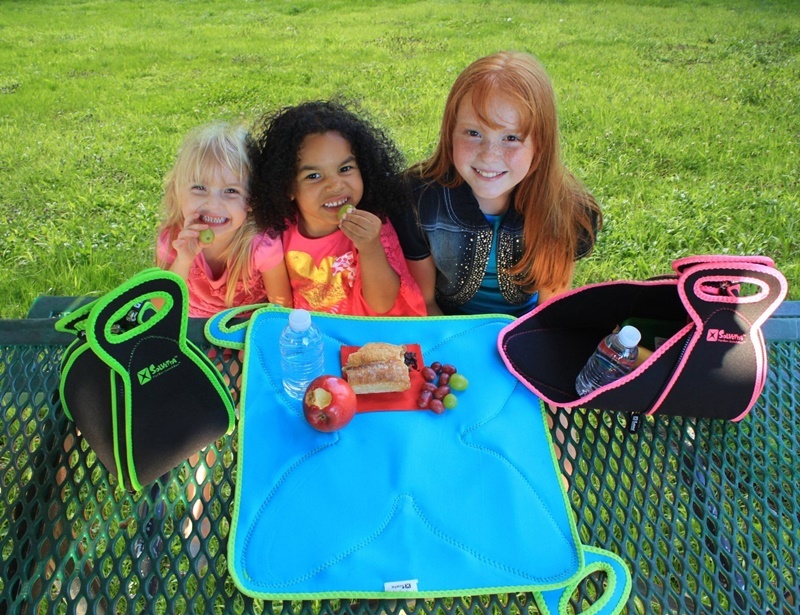 Provide your kid with a place-covering, to shield their eating area from any residues that may remain on the table. There are even some very cool lunch boxes that fold out. Pack along some wet wipes for them to clean their eating area as needed. Kids frequently trade lunchbox goods or may simply offer to share. The answer may seem straight-forward: tell your child or teen not to take food offerings from others. But around their peers, they may feel awkward, left out, or simply too tempted to resist. And if your child has never experienced anaphylaxis or another severe reaction before, they may not fully associate the consequences. Talk to your kid’s closest friends and their parents. Make sure they understand the severity of the milk allergy, and encourage them not to suggest food sharing when your kid is present. Pack lunches that they love! 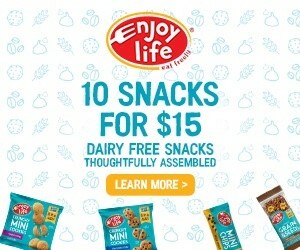 Satisfying treats like dairy-free chocolate “monkey” milk singles, allergy-friendly cookies, or a bag of their favorite chips can help to keep curiosity at bay. Also, keep their lunch interesting with favorite sandwiches, “sushi” rolls, tacos and other family favorites. Keep an eye on their lunch box to see if any foods are returning home. And check in with them every month or so to find out if there are any lunch box items they don’t particularly like. They may also want to mention foods they’ve seen other kids eating that they want to try, too. All these things can help you make lunches that prevent the desire for trades. As they get older, involve them in the lunch making and the grocery shopping processes. For some reason, food has become a primary reward in schools, with pizza parties and ice cream socials topping teachers’ go-to lists. And while your kid could simply abstain, this can easily make them feel left out. 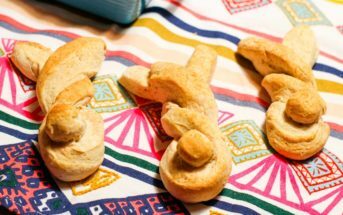 Present teachers and other school officials with food-free fun options. Kids often appreciate these even more! Request to store dairy-free, individually-wrapped ice cream bars at the school. They typically have a freezer available for the faculty or in the nurse’s office, and with a doctor’s note, they might be able to accommodate. Keep your own stock of frozen dairy-free cupcakes. When a birthday or treat day is on tap, pop one of the frozen cupcakes into your child’s lunch box. It should defrost in time for the celebration. 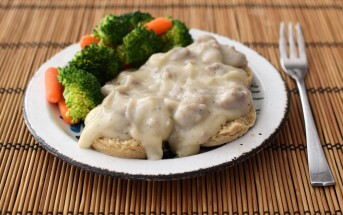 Try to time your child’s lunches with what may be served at school. If a pizza day is happening, pack some homemade dairy-free pizza or a pizza sauce “dip” with breadsticks. To further safeguard your allergic child or teen, it’s important to understand your rights. 504 Plans, an Individual Health Care Plan, and other accommodations are available for food allergic kids in school. These can help to implement some of the suggested solutions above and protect a loved one with milk allergy from high risk dairy foods. 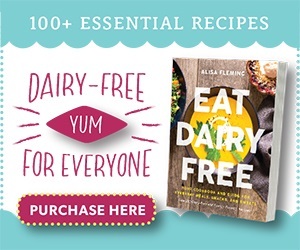 For more dairy-free solutions and recipes, enjoy my latest book, the 2nd Edition of Go Dairy Free: The Guide and Cookbook (massively expanded!). Alisa, I love your site (and your book)! Thanks for making Flavored Snacks #1 on this list – they are more scary than milk for just the reason you stated; invisible milk dust travels quickly especially with young children. My son with milk allergy just started first grade and you’ve offered some great suggestions. Thank you! What a comprehensive list of tips. I love those folding lunch boxes, I’ve definitely considered getting one for myself! Right?! Those are so cool and great for travel, too. These are great tips. Here’s one you may not have considered – two years ago, my daughter was in the lunch room when a senior prank food fight broke out – the seniors loaded up with frozen yogurt and when the signal went the yogurt and milk flew – she had heard rumors so was prepared – she immediately ran to the bathroom to hide until it was over – one problem – she forgot to take her lunch box…luckily it was spared – but she was surrounded by tables with milk on them and fellow students with yogurt and milk in their hair. All students were asked to clean up – she simply walked over to the side – no one questioned her and the next class period as teachers were saying how bad this one – other kids said it was only food – and she spoke up and shared that she was allergic to dairy and this could have caused her a lot of discomfort and possible anaphylaxis had it been ingested or on her skin and then ingested. While not common having an “escape” route is important – from this day on she always sits at an end table near a bathroom or door. Wow, that’s crazy! I’ve never heard of such a thing, but can only imagine her fear with this. Thanks for sharing Sue. How scary! So much to consider with a kid with a milk allergy instead of just an intolerance. I hope more parents are aware and kind to help! I had no idea a milk allergy was different the lactose intolerance! Thank you so much for the education! Indeed it is! And there are different types of allergies, too (IgE and non-IgE) which I will cover more soon! I am meeting opposition to a request that all students wash their hands when they get to school and after eating. This is for a kindergarten class of 25 with two teachers. Any suggestions? Have you put together a 504 Plan? If you are in the U.S. (there are some options in Canada, too), 504 plans for disabilities are a right for those with food allergies, too. Under a 504 plan, you can work with the school to create required policies such as hand washing in your child’s classroom. In our homeschool group we have natural baby wipes in each classroom. It’s a great way to get that friction cleaning without having to take a class to the restrooms every time. Not sure what this would look like in public school, but it works great for us. Hope that helps. That’s a great idea, thanks for sharing Jamie!